Liverpool emerged victorious from the game and now sit on the top of the table with the 15 points, the maximum from the opening five matches. Jurgen Klopp's men started off brilliantly. Roberto Firmino netted less than a minute after the game started but his effort was ruled offside by the linesman. The Reds proved to be more dangerous than their opponents but simply could not find the goal. The match soon evolved into a scene where both teams were trying to frantically intercept the ball. Tottenham slowly became more involved but without much creativity, they were largely unable to trouble Alisson. Before the match, Mauricio Pochettino's team had conceded four goals and all of them came from headers. Georginio Wijnaldum broke the deadlock from a setpiece and he headed the ball straight into the net. Although Michael Vorm managed to punch the ball out, it had already crossed the line and the referee ruled in favour of Liverpool. Minutes after half-time, Firmino doubled the lead for his side. Tottenham looked more vulnerable than ever and was unable to respond to the threats from the visitors. 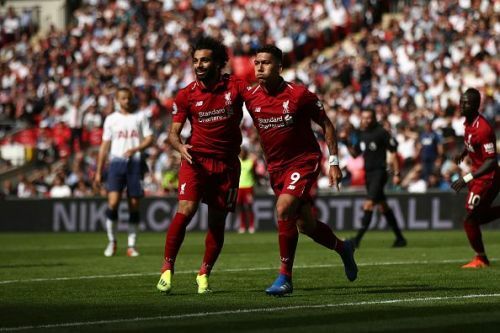 Mohamed Salah was expected to be more active throughout the game, but both he and Harry Kane were both unable to contribute much for their sides. Liverpool looked far more comfortable than the hosts at Wembley Stadium. With this victory, they surely looked prepared to face Paris Saint-Germain at Anfield. Thomas Tuchel has also won all the Ligue 1 matches since opening day. Looking at all the competitions he has been in-charged off, Tuchel has made it six wins out of six, a new record for Les Parisiens. Be it luck or true skills, Liverpool is one of the most dangerous clubs in the EPL. Klopp could be on his way to winning his first Premier League trophy with this team. As for Tottenham, Pochettino ought to reflect on how to get the best out of his team and motivate them to be as great as last season. Erik Lamela came on to score as a substitute in injury time, but it was insufficient to get a point from the game. The Lilywhites have lost to Watford and now Liverpool after a 0-3 thrashing of Manchester United. Here was how Twitter reacted to the result of the game.
.@LFC have not lost an away game when Roberto Firmino has scored (in all comps). Liverpool looking powerful! Took a bit of time but a marked improvement in that side since Klopp’s arrival. 14 attempts on goal with 10 on target. A 0-2 scoreline is generous for Tottenham. A pretty routine win for Liverpool. In truth could have won by a greater margin. As for Spurs, the whole thing looked very messy. Difficult to work out exactly what system they were supposed to be playing and looked like the players had no idea either. Tottenham vs Liverpool is now the Premier League's highest-scoring fixture of all-time (152 goals), overtaking Arsenal vs Everton (151 goals). Liverpool have won their opening 5 PL games for the 1st time, the 9th time this has been achieved in the PL era. Wow, Liverpool making hard work of things as always! Another narrow win your luck is running out soon. Full time: 15 points from 15 for Liverpool. Lots of room for improvement for Liverpool, not clinical enough going forward but overall heading in the right direction. • Liverpool hold on for the win!